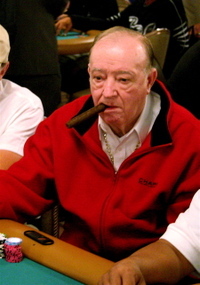 Paul "Cigar" McKinney, our favorite octogenarian poker player who famously attributed his 2005 WSOP Seniors Event win to a lifetime of "moonshine whisky, big cigars, and young women," was 1 of 16 people nabbed during a gambling raid in Kingsport, Tennessee last Friday. In lieu of a Oops! I Crapped My Pants joke, we'll honor Cigar and his penchant for young women with photos below and after the jump (NSFW) of our favorite Aussie top-dropper Emily Scott.